Will arrive in plain brown or white box with no labels. Packing slip has no mention of growing or hydroponics. 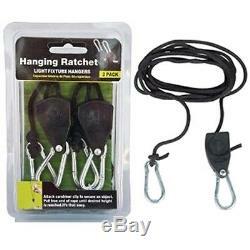 Every Solar Storm comes with a free pair of ratchet light hangers. Coverage is 2.5' x 2.5' for veg, 1.5' x 1.5' for flower. Available in Veg, and Bloom. The SolarFlare 110 LED Grow Light is California Light Works smallest LED grow light unit that delivers quite a punch for its size and power. 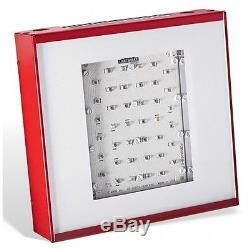 It includes 22 super intensity 5 W LED emitters for total nominal power of 110W. Actual power draw of the SolarFlare 110 is around 85 Watts. The SolarFlare 110 also has an output plug that allows up to 20 SolarFlare 110 units to be chained together using the optional daisy chain power cords. This makes the installation of multiple SolarFlare 110 units a breeze by allowing up to 20 units to be powered by the same outlet using a single timer. NEW Feature Improvements for 2014. New Super High Flux 5W LED diodes. New high efficiency Universal Voltage 90-2077 VAC Drivers. New Super High Flux 5W LEDs. Latest high efficiency dies from manufacturers. Jewel quality glass primary optics. Results: 10-15% more light, same power. 10% More LEDs per unit. SolarStorm 800 IS NOW SolarStorm 880 176 LEDs instead of 160. SolarStorm 400 IS NOW SolarStorm 440 88 LEDs instead of 80. SolarFlare 200 IS NOW SolarFlare 220 44 LEDs instead of 40. SolarFlare 100 IS NOW SolarFlare 110 22 LEDs instead of 20. Brand new proprietary driver design, Constant current driver. Little or no increase in total power Power usage by additional LED count is neutralized by higher efficiency. 25% more PAR light output. Little or no increase in power usage. 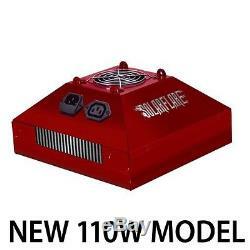 California Light Works Solar Flare 110w LED Grow Light is the latest LED technology for indoor grow rooms and greenhouse gardens. The Solar Flare 110w LED Grow Light balances between having high quality LEDs with strong intensity at an inexpensive price relative to other LED grow lights on the market. Get this unit in one of two spectra: Veg Master or Bloom Booster. 22 high power 5 Watt LED emitters. Uniform 120 degree angle primary optics. Clever chainable design: allows up to 20 lights to be powered from the same plug using the same timer. 22 High Quality 5 watt LED bulbs for 110 watts of intense lighting for your plant canopy. A total of 85w actual power draw provides high PPF (photo-synthetic photon flux) that penetrates the plant canopy and exceeds the PPF of a 250 watt HPS grow light system. 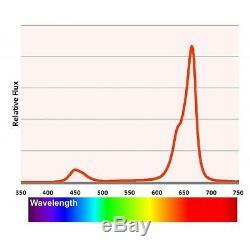 Full cycle color spectrum design to give you the plant perfect light spectrum for high quality yield, verified using a calibrated NIST-traceable radio-spectrometer. 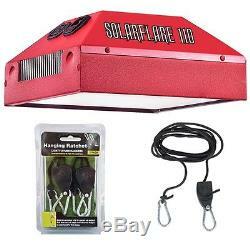 SolarFlare LED plant grow lights will give you a 50% power savings over a HID lighting system. Covers a 3' x 3' plant growing area for vegetative Growth, 2' x 2' for flowering growth. Built-in Daisy Chain plug allows up to 10 LED lights to be plugged in to a single power outlet and timer. Designed and manufactured in the USA by California Lightworks. Operating Voltage: Universal Voltage: 90-277 VAC AC / 50-60HZ - CAN BE USED IN ANY COUNTRY! Total Power Consumption: 83 Watts. Maximum current at input: 0.7 Amps. Plant coverage: from 18" to 24" distance, 9 square feet. Color Spectrum Optimized for Vegetation and Bloom: Balanced Blend of Deep Blue, Blue, Deep Red, Red and Warm White. Durable powder coated 6063 aluminum and ABS sheet metal construction. Two fully integrated high efficiency switching mode power supplies, 80 watts each. Highly effective heat management via integrated fan and large heat sink. Dimensions and Weight: 9" L x 9" W x 4 H, 7 Pounds. LED Expected Life: 50 to 80,000 Hours (8+ years) under a typical 16 hour day operation. LED Expected Output after 50,000 Hours of Use: >90%. Cooling Fan Life: 50,000 Hours MTBF. Operating Temperature: Between 5 and 104 Degrees Fahrenheit. Operating Position: Light facing down at plant canopy. That says a lot about the quality and performance of their growing lights, and the company itself who is willing to back their products for that length of time to better serve customers like you. Many countries outside of the US use 240v, this item CAN be plugged directly into a 240v plug, no transformer needed! 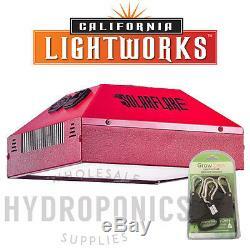 The item "California Light Works 110W LED Grow Light Bloom Booster with FREE Ratchet Hangers" is in sale since Tuesday, June 10, 2014. This item is in the category "Home & Garden\Yard, Garden & Outdoor Living\Gardening Supplies\Hydroponics & Seed Starting\Grow Light Kits". The seller is "wholesalehydroponicssupplies" and is located in Phoenix, Arizona. This item can be shipped worldwide.